Supply and Demand Kale Salad Homestyle for our Summer Solstice dinner. It's true that I offer up Supply and Demand as one of my regular restaurant haunts when people ask me where to eat in Ottawa. And despite their offerings on their Raw Bar and seafood selections from the mains, I seem to get permanently stuck in their veggies on the Small Plates and From The Garden section of the menu. 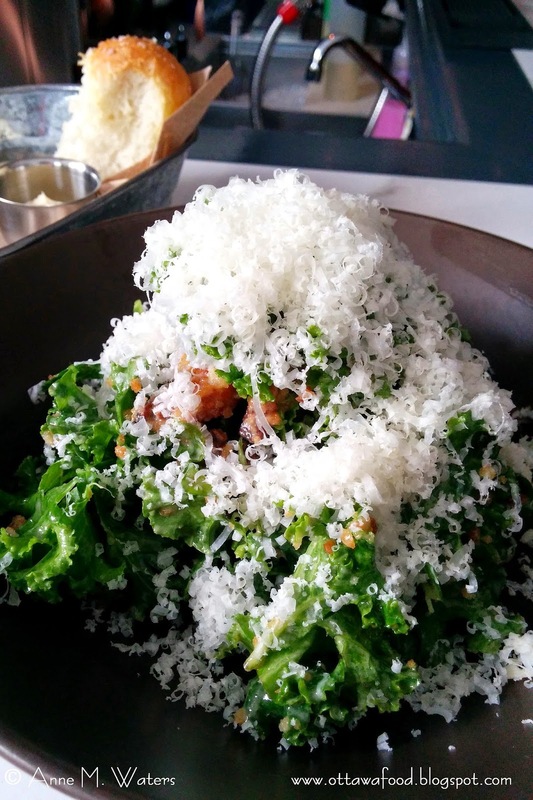 My most repeated dish over my many visits is their signature Kale Salad. My visits are often impromptu and covering for me instead of cooking for myself. The last two times I dropped in quickly for a Kale Salad and a Beet Salad. Re-energized, I was good to go. After my harried attempt at making their Kale Salad for my Summer Solstice dinner, all I can say is, don't come to my restaurant if you want to eat in a hurry. Eating out has its benefits. The number one rule of cooking if using a recipe is to read it through first to gather the ingredients and to absorb the instructions. I like to live loose with recipes but I was committed to following this one to a tee. Mainly because I already know that the space between Chef Steve Wall's Kale Salad perfection and what I could add to elevate the dish to my personal tastes is non-existent. Had I followed my number one rule of cooking, I would have probably washed and massaged the kale sooner to allow for a proper and thorough drying. I would have known that the already cooked bacon in the freezer wouldn't do because I needed the rendered fat to toast up the coarse bread crumbs. And speaking of coarse bread crumbs, well they take a bit of time to make if you are starting with frozen old buns from the freezer. What I did do right was make sure I had some fresh Manchego cheese on hand to snow peak my mountain of salad. Although I only had the one head of kale, I made the full batch of dressing and used more the next day with my grilled asparagus in place of a gribiche sauce. I would consider using this dressing for my classic romaine Caesar too. If you have an awesome head of curly kale like the one I had from Roots and Shoots Farm, by all means, make the much hailed Kale Salad à la Supply and Demand. But if you are in a hurry to eat, head on down to 1335 Wellington Street West and hope they can tuck you in at the end of the bar. To make the vinaigrette, purée anchovy fillets, Dijon mustard, capers, shallot, garlic, vinegar and water in a blender or VitaMix until smooth. Chef's Tip: Allow some caper brine to be included with the capers; it will give the vinaigrette an extra "capery" flavour boost. Slowly add the oil with the blender running. Season with salt. Chill the dressing until using. Remove the stems from the kale. Wash, then soak in ice cold water. Using ice cubes, massage each leaf individually. The leaves will turn a strong green. 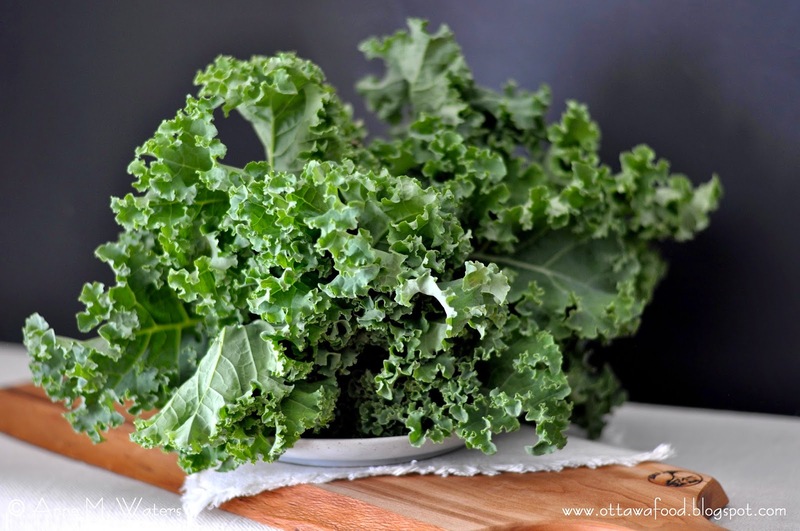 This tenderizing process removes the leaf's stiffness and will give the kale a more lettuce-like texture. Once the kale leaves are torn into pieces, pat dry with a towel. To make coarse bread crumbs, place chunks of old bread in a 300°F oven for 10 to 15 minutes to dry and then crumble it in your hands until you have pieces the size of small peas. Fry bacon slices until the fat is rendered and bacon is crispy, remove bacon and save the bacon fat in pan. Add the coarse bread crumbs to the hot bacon fat in the pan and sauté until the crumbs are golden. Season lightly with salt. 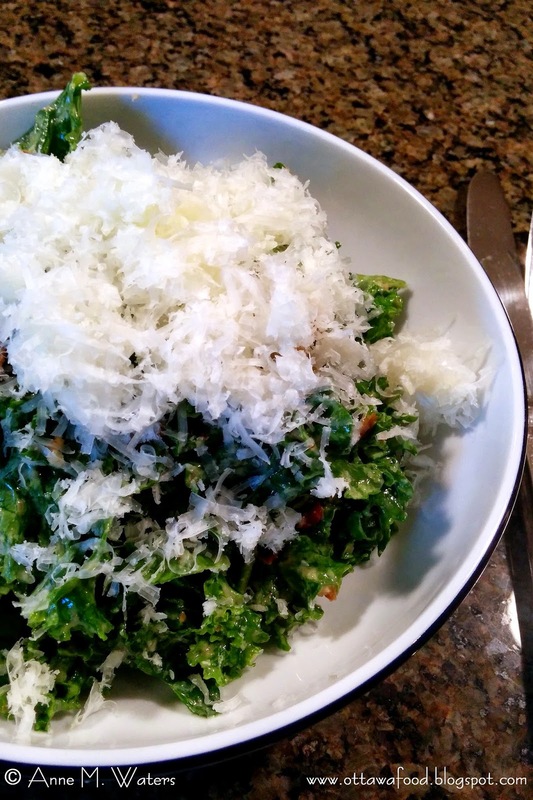 Put the kale in a bowl for tossing. Season it lightly with salt. Add the bacony bread crumbs, and crumbled bacon. Don your kitchen gloves. Dress the salad with the vinaigrette and massage it into the leaves. Place in serving bowl and top with shredded cheese using a fine microplane. In the middle of preparing this post I had to zip out to do an errand in the village. Dinner service had just started at Supply and Demand so I sat in for a quick bite. Kale salad to start, of course. Comparing this delight to my weekend effort, I think my Supply and Demand Kale Salad Homestyle was a success.